Obligatory disclaimer: This post is based on a media event held by the Lunchpad, so portions are sized down and it was all free to me. The Lunchpad has been holding court in Hayes Valley’s Noir Lounge for about three years now, transforming the posh, gothic nightlife space into . . . a posh, gothic daytime space with breakfast and lunch fare. 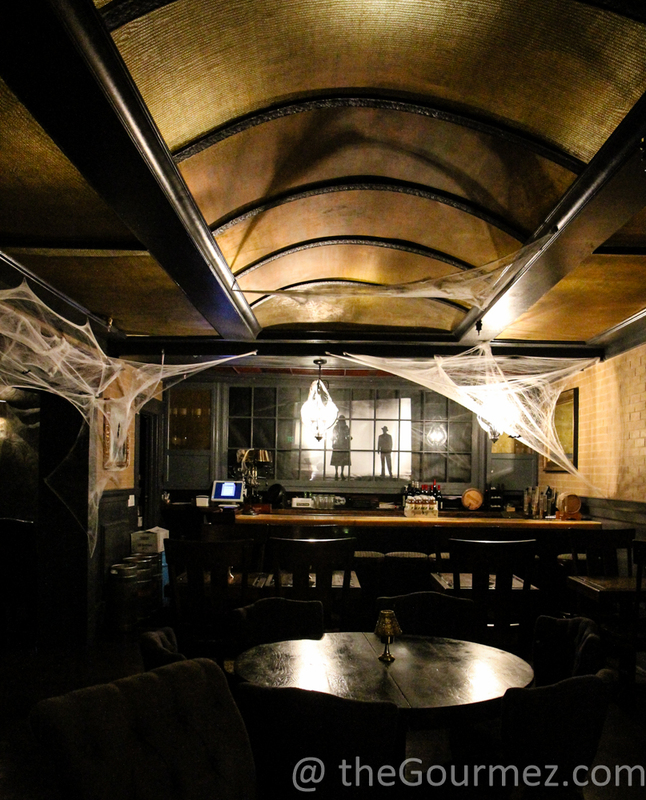 Okay, it’s somewhat less gothic when it’s not Halloween. That unique atmosphere—one doesn’t usually think dark for brunch dates—may be the Lunchpad’s biggest draw. Nah, who am I kidding. 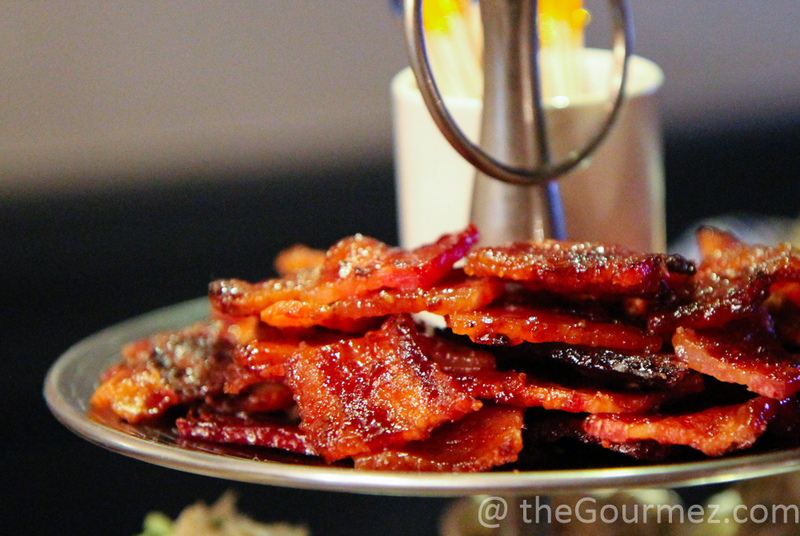 That’s the candied habanero bacon. It makes an appearance in a wide range of the Lunchpad’s sandwiches as well as in their signature drink, the Brunchpad Bloody, which makes its appearance on the weekends. 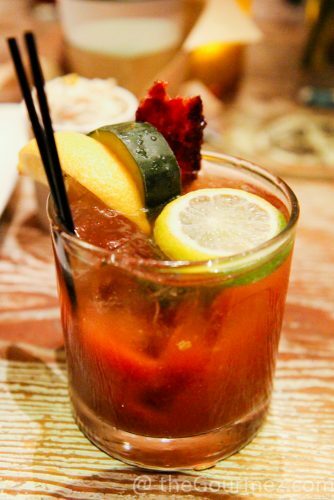 This bloody mary boasts extra earthiness, likely from a healthy dose of worcestershire sauce in the blend. It’s so savory, the bacon garnish comes across as bright by contrast! But among the fancy bacon options in this region, and there are many, the Lunchpad’s gets that sweet + savory + spicy balance just right. The Brunchpad Bloody isn’t the only menu item that makes a rare appearance. 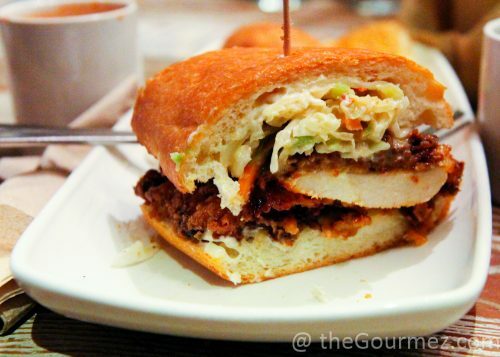 Co-owner Chris comes in on Wednesdays only to offer his special fried chicken sandwich, the Chicken Run. Our reactions to these ranged from delicious (the majority), to a little dry and overcooked (me and my shall-remain-nameless new media friend). If you like your fried chicken battered in a gritty buttermilk base, you should like the Chicken Run, and the garlic aioli and sweet & spicy coleslaw mostly solve the moisture problem anyhow. 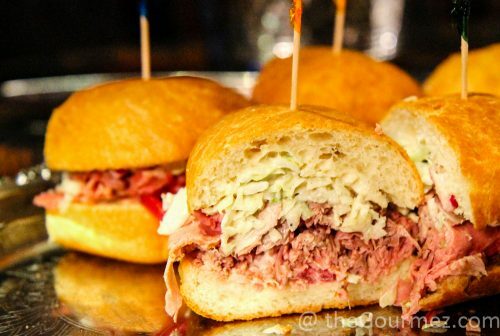 Coleslaw is also a star player in the Roast Beast. The slaw has a horseradish, blue cheese, and celery seed bent in this sandwich. Those pungent ingredients are used sparingly enough for the celery seed to stand out from among them, which I think is wise. The garlic aioli again did a great job imparting flavor and moisture. My slices of beef were very tender, though the coleslaw did most of the heavy lifting in terms of taste. I’d definitely eat it again, and I’m not a big roast beef fan. 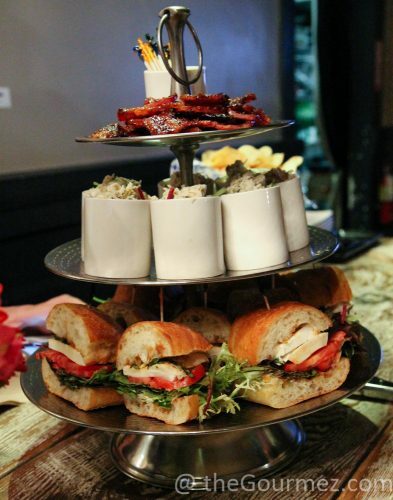 The sandwich most worth sampling, or perhaps shoveling into your mouth, is the Turkey Drizzle. Chris called it the kitchen sink sandwich, which is both accurate and unfair to this delicious combination of, well, of everything. 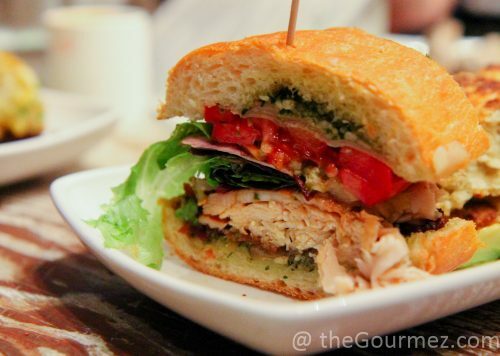 It contains warm and tender roast turkey, the candied bacon, swiss cheese, cashew pesto, giardiniera, greens, tomatoes, and a beautiful balsamic reduction sauce. 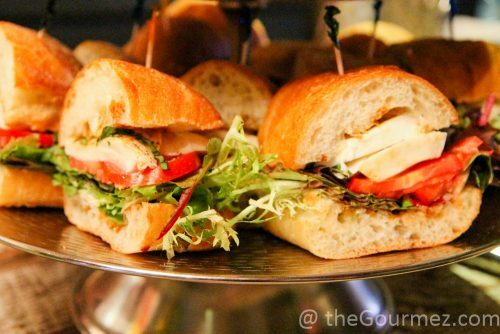 Of all those ingredients, the giardiniera is what makes the sandwich a star, intensifying the vegetable element while simultaneously adding a tang your tongue will keep chasing. The giardiniera is also available by the jar and is one of the Lunchpad’s signature items along with the bacon and Grandpa’s pickles. These giant cucumber slices are cold-brined and ready in as few as three days. That translates to a pickle that retains its crunch while offering a mildly sour note that pleases. 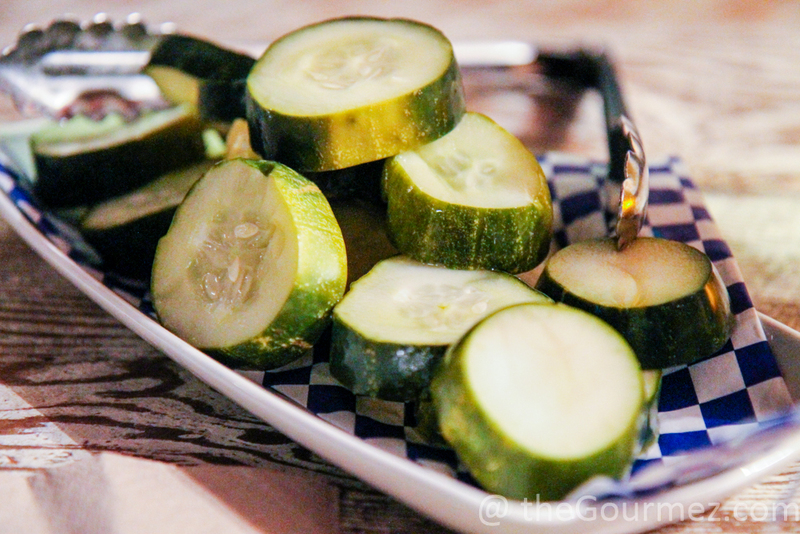 If you’re a pickle fan—good news!—the Lunchpad is offering a pickling class on Sunday, December 18! The cost is $20, and interested parties can register here. I hear hot peppers may get some sweet treatment there as well . . . But I am not yet done working my way through the Lunchpad’s sandwich list! The Dolce Vita is your standard caprese-style sandwich worth noting here for that sweet, in multiple ways, balsamic reduction sauce. The Chicken Lil, a sandwich served to us as more of a salad shooter, offers wonderfully moist sliced breast meat, though a livelier mixture of ingredients would be nice. 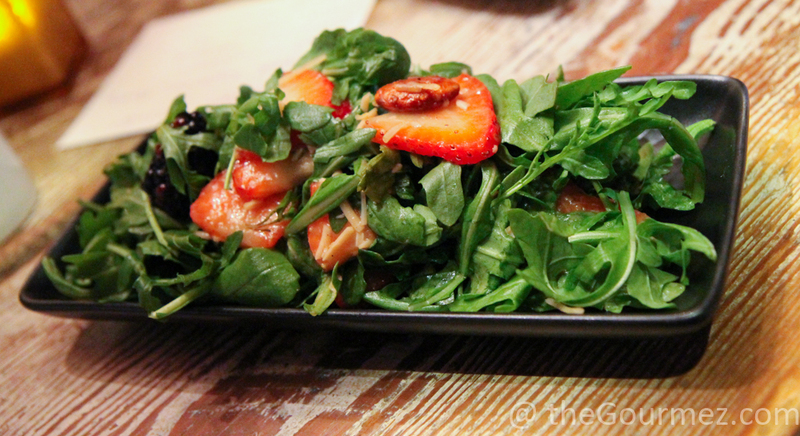 I did not try the Berry Delicious salad, but the reaction I heard was similar to my thoughts on those last couple of dishes: nicely done, but not enough to stand out from among the crowd. But there is plenty at the Lunchpad that does, especially in the brunch department. 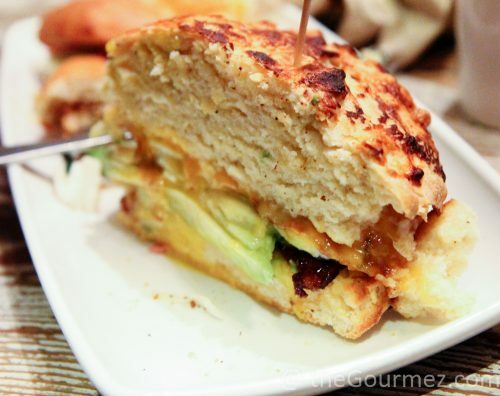 The breakfast cheddar biscuit is humongous and comes dressed to impress any weekend hangovers. That’s right, melted smoked cheddar, fried egg, avocado, habanero candied bacon, and garlic aioli? Be still my grease-loving heart! The basic biscuit is $7; avo and bacon are add-ons well worth the addition. For a biscuit that size, it’ll still be a good value. The biscuit itself is respectably made, kneaded just beyond the fluffy zone so it can stand up to the pressure of all that vein-clogging goodness. 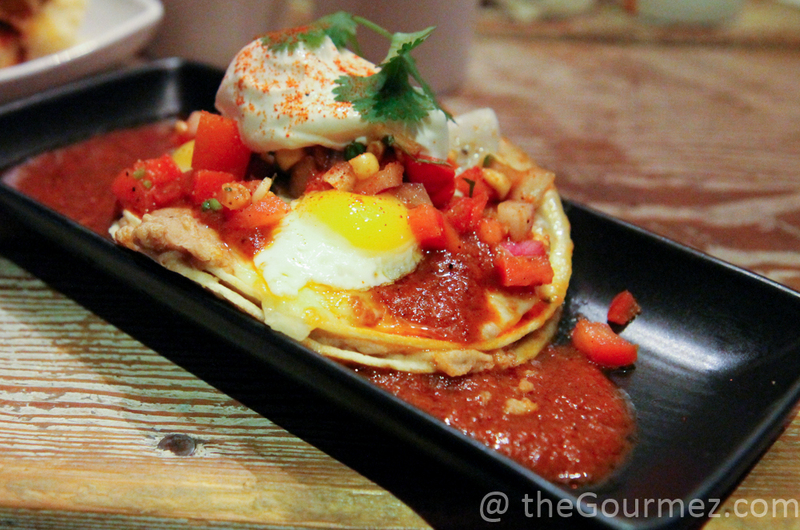 Also only on the brunch menu is huevos rancheros, and the Lunchpad makes a stellar one. Our small version was plenty of food for me, especially after all the sandwich samples that came before it. Rest assured, the real version offers plenty to please your inner glutton. It features six-inch tortillas instead of our four-inch ones and chicken eggs instead of quail, but the delicious, ultra-fresh enchilada sauce, tasty corn-laced pico de gallo, and pork chorizo that miraculously doesn’t drip with grease are the same. Refried beans add an extra layer of strength to help the tortillas stand up to all that performance pressure. I’ll end this feast in the opposite order of a meal: With soup! Besides the bacon, this tomato bisque was my favorite part of our brunch. 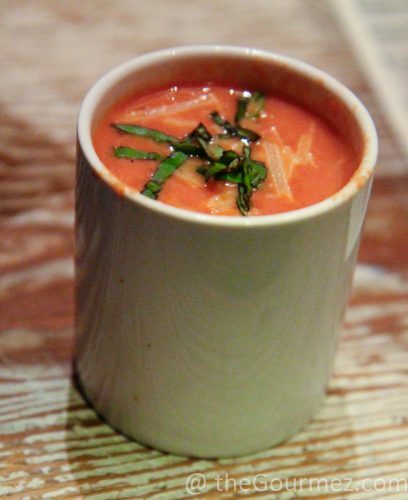 The roasted tomato is soothing and flavor-punched, and getting a bite of basil with it makes it more than pop. It explodes! If it’s on the menu when you visit, GET IT. So if you stroll through Hayes Valley on a lovely San Francisco day and find your curiosity piqued by a sign advertising sandwiches beside a snazzy lounge, head on in and explore the Lunchpad’s sandwich boards. Yes, I find the dark super inviting! Pick an item featuring pickled pickles, pickled veggies, candied bacon, tomato bisque, or brunch and you won’t be disappointed. But you will be full. Thanks to the Lunchpad team for this sampler of their signature dishes! And don’t forget to sign up for the next pickling class on December 18.